prevent the Environmental Protection Agency (EPA) from establishing strict emission limits for wood and pellet stoves and boilers. The bill does not entirely seek to maintain the status quo, as it would still allow outdoor boilers and indoor furnaces to be regulated, which they aren’t in most states. It would prevent the EPA from setting emission limits tighter than 4.5 grams an hour for wood and pellet stoves, which has been the de facto national standard since 1995. Jan. 27, 2015 Update: This bill died in Committee and is no longer pending. The bill was introduced on April 4, 2014 by Missouri Republican Blaine Luetkemeyer and had 12 co-sponsors as of June 2014, ten of which are Republican and two Democrats, including one relatively liberal democrat, David Loebsack from Iowa. 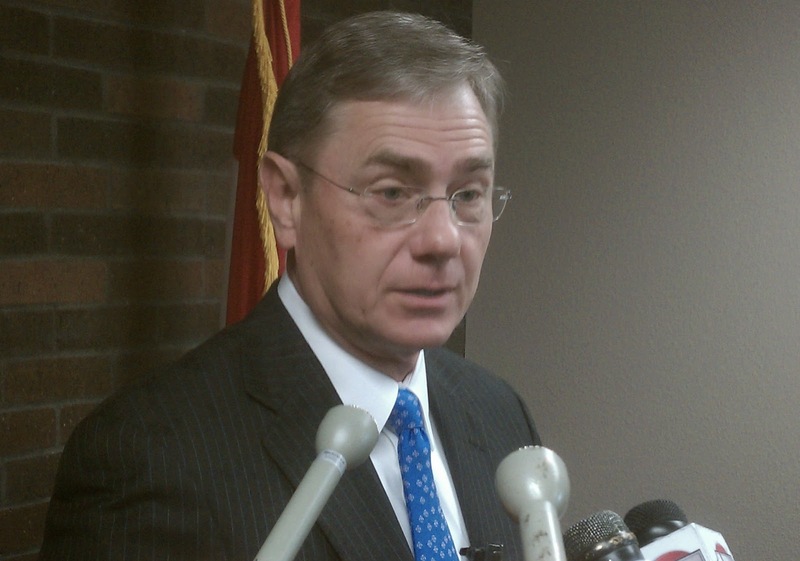 GovTrack’s analysis tags Luetkemeyer as a far-right Republican representative. This same preeminent bill tracking service, gov.track.us, gives this bill an 8% chance of getting past committee and a mere 2% chance of passing. This is the fate of the majority of bills introduced each year in the House but it does not mean that they do not serve useful purposes for the members who introduce them or the parties who drafted it for the lawmakers. The bill reflects what many stove and boiler manufactures wanted to see from the EPA rulemaking process in the New Source Performance Standards (NSPS). While Congressional bills can reflect just a particularly industry may want, the EPA’s NSPS is supposed to identify the Best System of Emission Reduction (BSER) that has been adequately demonstrated. BSER can be established with only a few stoves and then be applied to the entire industry, forcing all manufacturers to adopt the systems that can make the cleanest burning stove. An NSPS can be a “technology forcing” regulation and the main question appears to be what percentage of stove models will be forced to change and by when. This bill would stop the process of requiring BSER by stopping the EPA from implementing the second phase of product emission requirements included in the NSPS. The second phase is in 2020 or 2023 when the stricter emissions standards would be required. In addition, the bill softens time restrictions for manufacturers and retailers selling hydronic heaters and warm air furnaces, allowing them more time to sell existing stock. The bill also prevents the EPA from making any alterations in the auditing and certification method for a minimum of three years into the new NSPS, in order to prevent a backup at testing labs. The bill also compels the EPA to allow products that are already EPA certified to be grandfathered into the new regulations. The bill, drafted by members and staff of the Hearth, Patio & Barbecue Association (HPBA), arose when it became clear that the EPA was determined to propose strict emission standards for stoves and boilers. According to HPBA, the EPA abandoned a “collaborative approach” to the rule making and “began to propose radically new ideas based on assumptions which went far beyond their available data.” Due to lack of funding, the EPA has not been able to build many of its own data sets and often has to rely on industry for emission data. Industry has shared some data but is also strategically withholding some data that they hope will prevent the EPA from setting stricter standards. In response, for parts of this NSPS, the EPA has been turning to data sets from other countries, relying on data from a few manufacturers who share it, doing their own testing among other strategies. The Alliance for Green Heat opposes this legislation and believes that it will hold back the wood heating sector from being embraced by the renewable energy community. We believe that wood and pellet stoves can and need to be held to a stricter standard than the 4.5 gram an hour set by Washington State in 1995. Most of the sponsors of H.R. 4407 are delegates whose constituents have a higher than average dependency on wood heat as their primary heating source. The national average is about 2.1% and the average of the districts of the co-sponsors in 4.9%. 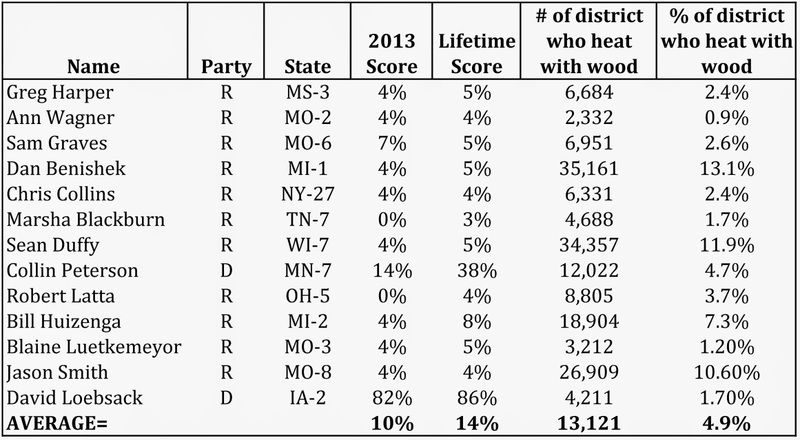 A fact sheet supporting HR 4407 put out by Rep. Leutkemeyer’s office erroneously said that, “12 percent of all homes burn wood as their primary heating fuel.” The table below highlights the scores of the co-sponsors according to the The League of Conservation Voters, who rank State representative’s “pro-environment” voting history on critical legislation involving environmental, public health, and energy issues. One of the two democrats, Rep. Collin Peterson represents the district that Central Boiler is in. on environmental issues by the League of Conservation Voters.